The STINGER Martini - A Hollywood "Cocktale"
The Stinger is a classic cocktail with some fun Hollywood history - in the 1957 film Kiss Them For Me, Cary Grant and Jayne Mansfield were drinking them. Grant seemed to have enjoyed the Stinger because he also enjoyed one in the film The Bishop's Wife. The Vodka Stinger even has starring role in a song line, "...Another chance to disapprove, another brilliant zinger. Another reason not to move, another Vodka Stinger!" from the Sondheim song Ladies Who Lunch. 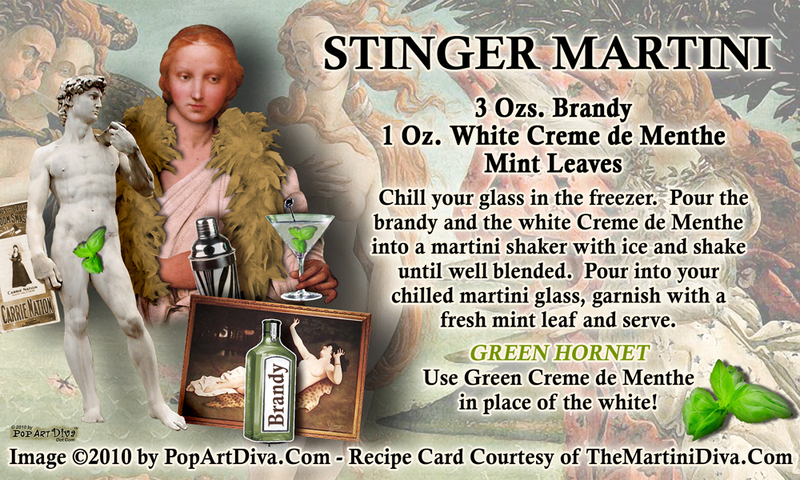 The classic Stinger is 3 parts brandy to 1 part white creme de menthe and I've added a mint leaf garnish. VARIATIONS: A Vodka Stinger replaces the brandy with vodka BUT if you keep the brandy and replace the white creme de menthe with green creme de menthe you get a Green Hornet! The Stinger is considered a "duo" cocktail - a drink that contains a liqueur and a spirit together with the liqueur giving the cocktail a sweet taste. If a creamy element is added a cocktail is a "trio". 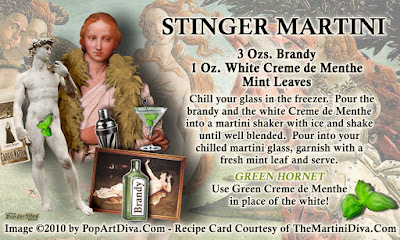 Enjoy your classic cocktail, The Stinger or try the variations - either way you're enjoying some cocktail history!